Battery Features · 100% high quality battery cells. · 100% Q.C. of every battery. · Manufactured by Hi-Capacity power products. · Color: Black. Capacity: 280mAh. 9V Battery. 9V Slots: 2 / AA/AAA Slots : 4. Chemistry: NiMH. Output: 9V DC 90MA. No Load Power Consumtion: 1W MAX. Full Load power consumtion: 5W MAX. Battery Chrge Rate: >90%. 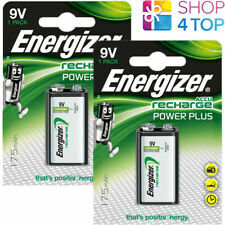 Energizer Power Plus is the ideal choice for devices with moderate energy requirements. The batteries can be recharged many times, thus protecting the environment and your wallet. 8 batteries total included. Expiration 12/2021. This is not our responsibility. Is it still under the manufacturer warranty?If an item is listed as new, it may or may not be under manufacturer warranty. Capacity: 280mAh. 9V battery. 2x 9v Ni-MH batteries. Weight: 140 g.
Fit for : 6F22(9V)li-ion rechareable battery. 8 X 6F22(9v) battery. Capacity: 600mAh. Only charging for one or more 9v Lithum battery,do not charging for other type of batteries. Output:DC 8.4V 400MA(1 9v battery). Capacity: 280mAh. 9V Battery 9V Slots: 2 / AA/AAA Slots : 4. Chemistry: NiMH. Output: 9V DC 90MA. No Load Power Consumtion: 1W MAX. Full Load power consumtion: 5W MAX. Cell Phone Accessories. Capacity: 350mAh. Shelf Life: up to 1200 cycles. Capacity: 350mAh. Shelf Life: up to 1000 cycles. Capacity: 850mAh. Output: 9V dc 90MA. Easy to read each battery charging state with inserted LED lights for each independent channel. Also known as the following: 1604AU \ 6LF22 \ 6LR61 \ 6LP3146 \ MN1604. We'll get back to you as soon as possible. ; computer accessories; radios; toys and Smoke Alarms \ Fire Detectors. Each battery is individually wrapped in shrink wrap ensuring arrival in perfect condition; expiry date engraved on base of each battery01 - 2022. Also known as the following: 1604AU \ 6LF22 \ 6LR61 \ 6LP3146 \ MN1604. We'll get back to you as soon as possible. 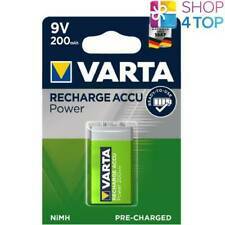 Once charged, the VARTA RECHARGE ACCU Power still retain up to 75% of their initial capacity after 12 months of storage. And other devices using 9V size battery. : For indoor use only. Batteries should be recycled. Do not discard batteries into household waste, fire, or water. only for indoor use. Adapter Type: External AC adapter. 20 of Hitech 9V250mAh TOP Rechargeable For Electronics+FREE GIFT: 9v Charger. And other devices using 9V size battery. : For indoor use only. Batteries should be recycled. Do not discard batteries into household waste, fire, or water. Batteries may get hot while charging. only for indoor use. ( also known as 9v li-ion / lipo battery ). Compatible battery type: 9v Lithium ion Battery. 4 slot model9V Li ion / Lithium Battery : DC 500mA 1, 260mA 2, 125mA 3/4. Battery Capacity : 700mAh. There are NO EXCEPTIONS ! Hitech Model G984HH 9v250mAh Ni-Mh battery And other devices using 9V size battery. : For indoor use only. Batteries should be recycled. Do not discard batteries into household waste, fire, or water. And other devices using 9V size battery. : For indoor use only. Adapter Type: External AC adapter. AC Adapter Supported Volt. Input (AC adapter) Output (AC adapter): 120V AC 60Hz13.4w. Safety Standards: ROHS. Capacità della batteria: 800mAh. Tensione nominale: 9V. 1 x batteria ricaricabile 9V. nominale di ingresso: un ingresso micro USB /5.0 V. We are surely for help! Tempo pieno: circa 1,5 ore.
Also known as : 9Volt, PP3 ,HR22 MN1604,Bloc ,6lr61,1604au, x 22 ,etc. Replace battery : 9v ni-mh, 9v alkaline battery. USB 9V battery. Auto-charging : Auto turn light for led dedicator - charging : Orange light, Full : Green Light and auto stop charging. Battery capacity: 400mAh. Output: 9V. Compatibility: 9V battery. Input: Micro USB(5V). Replace dry battery perfectly.Energy-saving and durable. Cycle life>3000,increase 200% than normal battery which fits the low-carbon life style. 9V 9-Volt Battery Clip / Connector Snap. We'll get back to you as soon as possibl e. Looking for other batteries besides these?. Nominal Capacity: 1000mAh. Bundle: Bundle 1. Custom Bundle: No. Plug: US plug. Battery Type: 9 V Block. Battery Number: 4. Battery Size: 9 V. See all condition definitions- opens in a new window or tab. Read moreabout the condition. 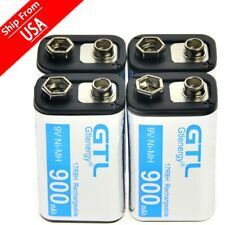 4 x EBL 9V battery. No Load Power Consumption:1W MAX. Full Load power consumption:5W MAX. we would very much appreciate a chance to make things right! 1 x user manual. Capacity: 600mAh. Only charging for one or more 9v Lithum battery,do not charging for other type of batteries. Fit for : 6F22(9V)li-ion rechareable battery. Output:DC 8.4V 400MA(1 9v battery). DC 8.4V 150mA(4 9V battery).